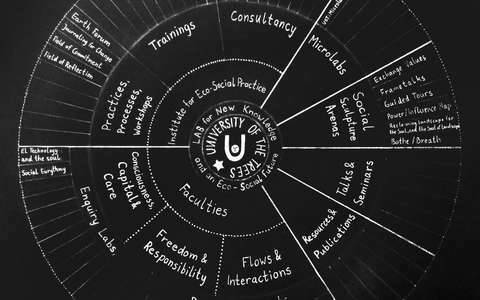 The Social Sculpture Academy has strong affinities with Joseph Beuys's Free International University, and with the wider stream of experiments in emancipatory education that connect self and world. All its programmes and experiments are concerned with the transformative role of imagination in enabling connective thinking and connective practice. 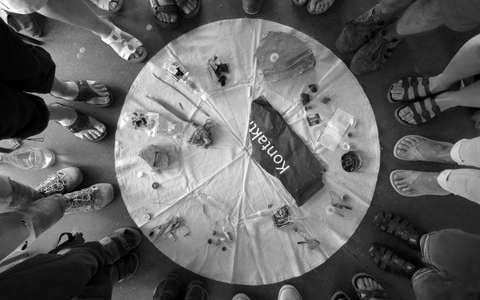 The Social Sculpture Academy currently has a number of pilot programmes. In Germany, Holland and India. Although they differ a lot in relation to each specific context, they are all 'enquiries' of some kind. Designing participatory processes that allow the work of the Social Sculpture Academy to emerge and evolve is the first programme of the Social Sculpture Academy in each place. All the programmes of the Social Sculpture Academy benefit from Shelley Sacks's 'Creative Strategies' approach and a 'Connective Practice for Mind-Shift Work' theory of change that Shelley has developed over 4 decades in and beyond the university in her practices and pedagogic approaches. One special feature of this approach is that it enables participants to come to new insights by exploring theory and new thinking in and through practice. The Social Sculpture Academy's 'creative, participatory enquiries' are informed by Joseph Beuys' 'social sculpture' proposals, Paolo Freire's 'education for democracy' pedagogies and the phenomenological insights of Goethe and imagination-based psychologists like James Hillman. They also benefit from Shelley's many years of practice as an interdisciplinary artist-teacher-researcher-writer-activist, who not only worked intensively with Joseph Beuys, and in the context of Europe, but has developed and extended the contemporary field of social sculpture into many different regions and political-cultural contexts. 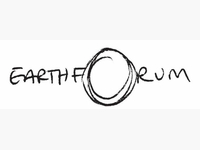 Earth Forum is a social sculpture - connective practice process relevant to many kinds of change-makers. Join us for this 1-day introduction and 3-day training opportunity in Oxford, in November 2018. Learn to guide this connective process and join the global community of Earth Forum facilitators. In German and in English! 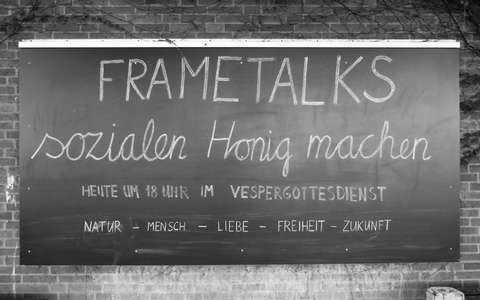 FRAMETALKS crosses many borders. Internal thought borders. Borders between nature and human. Borders between people. Its focus on 'imaginal thinking' creates bridges into the unfamiliar. According to Stefan Nadolny, the radical priest at the Neue Brüderkirche, "one of the borders that FRAMETALKS 'transcends' is the disciplinary boundary between art world and spiritual world or church." During the final weekend, this transcending of disciplinary boundaries became clear as the social sculpture action shifted beyond the local communities and the NGO sphere and beyond those already into eco-social practice. It was also part of the art-world's Museumsnacht (Night of the Museums) and a special FRAMETALKS church service led by Stefan Nadolny. Its initiator, Shelley Sacks says, "FRAMETALKS opens up a dialogue about contemporary forms of spiritual practice that have to do with self-determination and the connective, shaping process that takes place between human beings." "FRAMETALKS", she explains, "also invites reflection on 'suffering' and the need to distinguish between necessary and unnecessary suffering: on where to draw the line! On the relationship between the crucifixion of Jesus and the way human beings continue to 'crucify the world'." On Saturday and Sunday, we re-entered thoughts and experiences from the previous week through several rounds of distillation. Exploring one of the 5 Realities, indoors and out on the streets, through our frames and preconceptions of 'FUTURE'.